At some point or another you have heard about global warming and how it is effecting the Earth. However, if you don't see it firsthand, it is easy to wipe away the thought of it actually causing any damages. The truth is, the industrialization of our people has been destroying the natural resources of the planet for years. The results are quickly altered weather conditions and higher pollution. A few photographers have been able to capture the images people need to see in order to fully understand exactly what is going on. A Large Contributing Factor Of Global Warming Can Be Seen In The Overpopulation Of Mexico City. This Just Shows One The Most Densely Populated Regions On Earth. 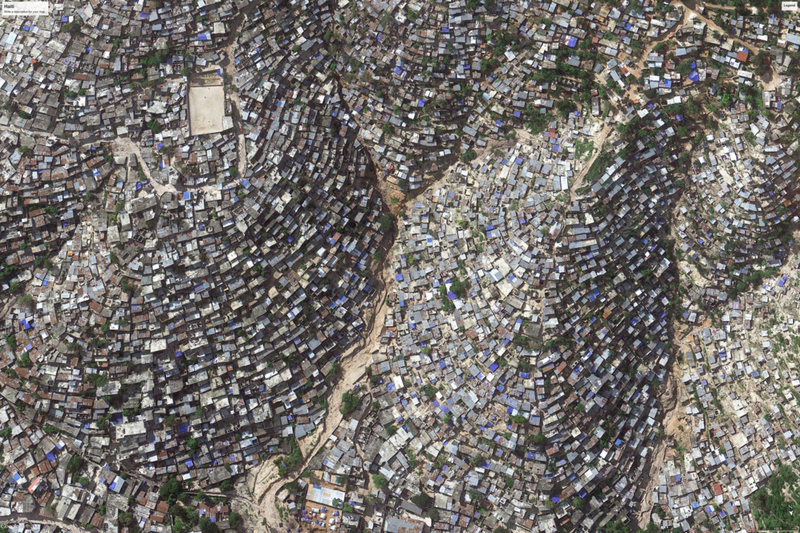 4 Million People Are Jammed Into The Poorest Country In The World; A Small City Called Port-au-Prince. Overflowing Landfills And Heavy Dust From Pollution Can Easily Be Seen In New Delhi Where 25 Million People Live. It Is Unbelievable To See Exactly How Much Electricity Is Required To Power A City Like Los Angeles. The Technology That We Have Created On Earth To Help Us In Sustaining Life Has Created Huge Problems For The Well-being Of The Planet. An Incineration Plant Located In Bangladesh Resulted In All Of This Garbage Being Left Behind. Oil Sands Are Processed In The Pollution Creating Plant In Canada. What Is Happening To The Landscape Of This Canadian Oil Processing Plant Can Be Seen Easily From This Eagle-eye View. The Development Of A New Dam In Oregon Caused This Entire Forest To Be Cut Down. Deforestation Has Caused Complete Mountains To Be Destroyed In British Columbia, Canada. Russia Is Home To The Largest Diamond Mine In The World. The People's Need For Oil Have Caused The Land Beneath This Field In California To Become Completely Dead. A Fattening Facility In Brazil Is Home To These Cattle. Nothing But Dark Skies Can Be Seen Because Of The Pollution Made By This Plant In The UK. The Heavy Air Traffic In London Leave A Cross-hatch Design Made From Pollution Every Day. It Is Obvious Through This Black Friday Photo That Humans Put Commercialism Above Everything; Even The Life Of Other Humans. This Nevada Desert Is The Final Resting Place For Tires That People So Easily Forget About After They Have Been Discarded. The Toxic Metals That Are In These Old Discarded Electronics Are Creating Major Issues In The Developing Countries That Leave Them In The Landfills. How Much Garbage Is In The Ocean Is Depicted While This Surfer Rides A Wave In Indonesia. In The North Pacific Ocean There Is Actually A Whole Island Made Out Of Garbage That Has Been Carelessly Discarded By Humans. The Animals Suffer When They Consume This Garbage Dying Slowly And Painfully. Endangered Animals Like This Elephant In Kenya Are Sadly Wiped Out For The Benefit Of The Human. One Of The Rarest Cats In The World, The Amur Tiger, Was Taken By Poachers. Humans Are Quickly Starting To Pay For Their Behaviors With Weather Conditions That Are Causing Chaos In All Areas Of The World. The Yellow River In China Smells So Bad From Pollution It Is Almost Intolerable. People In Colorado Have Been Forced To Move Because Of Massive Fires Starting From Global Warming. Cattle Eat Seemingly Unaware Of The Huge Fire Raging Right Next To Them. The Warmer Climates Are Melting Glaciers. This Polar Bear From Svalvarde, Norway Didn't Stand A Chance When The Food And Land Were Destroyed With The Melting Glacier. The Island Nation Of The Maldives Is At Risk For Being Completely Submerged With The Sea Levels Rising. Thankfully, There Are Some Humans Who Want To Stop The Effects Of Global Warming. 10,000 Greenhouses That Provide Food And Cool The Local Region Were Erected In Almeria, Spain. 30 Surprising Images Will Make You Look At Them Once More!